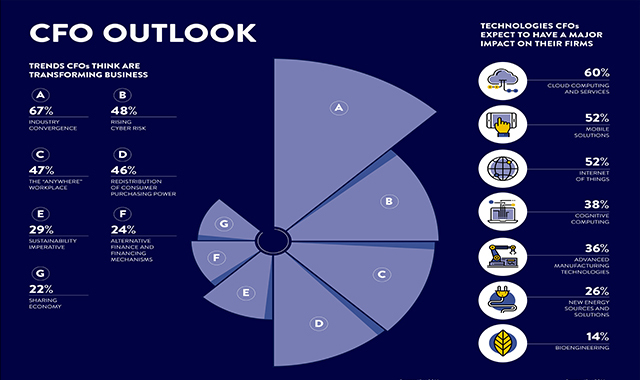 CFO outlook #infographic ~ Visualistan '+g+"
This infographic published in The Future CFO Special Report reveals the challenges and opportunities chief financial officers – and their departments – will face in 2017. The graphic reveals key trends transforming business, including industry convergence, rising cyber risk and the “anywhere” workplace. Additionally, the infographic highlights actions finance departments are taking in light of political and economic uncertainty, as well as CFO optimism around the globe.